I’m going to be honest (because It’s my blog and I can if I want to), my brain has morphed into a big ball of mush recently. So much so, that when I thought “ooh festive nail art!” it was immediately replaced with thoughts of “but nap rather” and “does cooked pasta go bad after 3 days?” But festive nail art I must! So I pioneered on, for the sake of the world and my readers and most definitely my atrocious looking nails. Fortunately, Essence was there to help! 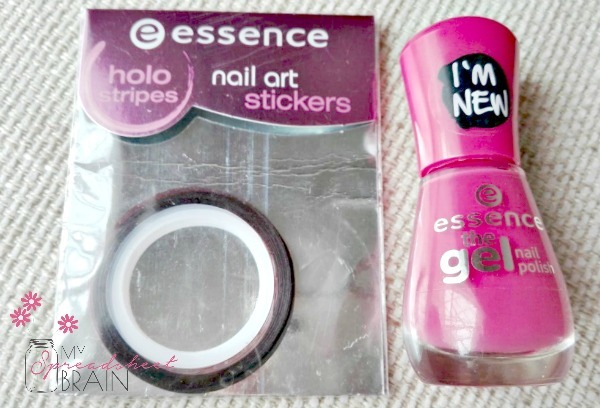 The new Essence ‘All In One complete care’ is a top and base coat all in one. As a base coat, this multi-talented gem preps your nails for manicure, by filling in small ridges. 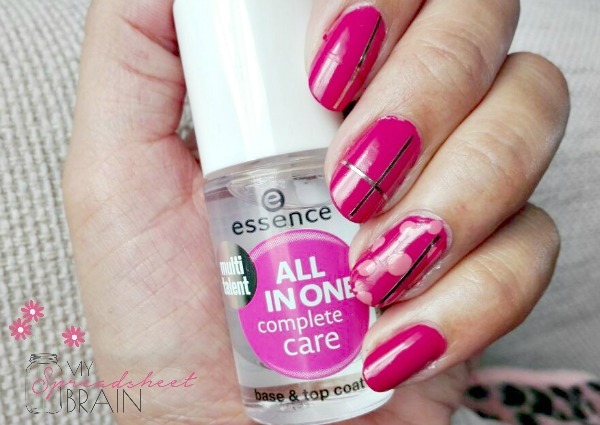 Once you’ve applied your color, you then top it up using the All In One as a high shine top coat. Sounds legit to me. 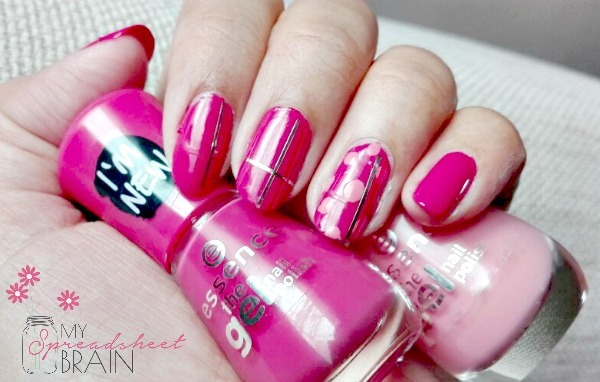 I tried it out with this weeks festive mani accompanied by #75 ‘Perfect Match’ and #77 ‘Dreaming of Love’. The warm, rose pink #77 was my base color and I thought to top it up with hair pin polka dots using the soft, dusty pink #75. I call them “hair pin polka dots” because I literally use a hair pin to make them. I know, right? Who has time for complications when your kid is running around with a poop filled diaper, demanding toast and Barbie. Priorities, dear readers, priorities! Anyways, once I got my life in order, I grabbed my hair pin and made the polka dots on my ring finger. It didn’t look festive enough so I tried my hand at “Christmas gift” inspired embellishment using the Essence nail art holo stripes (you may remember them from this post). Easy peazy lemon squeezy! See? You don’t have to be a professional nail artist to have merry looking nails this December! What do you think about my festive nail art? Would you try it at home? Husband, do you still think I’m pretty? Love the nails!! I want to try this with red and gold dots. Love the bright pink, it’s so festive! The Rose pink looks great for this time of the year! And its such a natural look too!